Dana Grubb is passionate about teaching and studying the Word of God. In 2002 she began writing Bible Study material for the Ladies Bible Class at Northside Church of Christ in San Antonio, Texas. Over the years she has seen the desire women have for in-depth Bible studies that lead them to a better understanding of God’s word and help them develop a closer relationship with Him. Dana enjoys writing and speaking to women. It is her desire that women experience God's love in their lives. Her first book Changed by Jesus: Lessons Learned from the Women Jesus Touched, shows women how Jesus continues to change lives today. Dana's second book, Used by God: Lessons Learned from Women of the Old Testament, teaches women how God values women and how He continues to use women today. 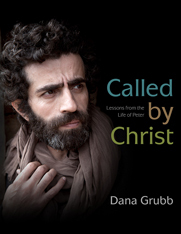 Dana's latest book is a study of the life of the apostle Peter. Called by Christ: Lessons from the life of Peter looks at what it means to be a follower of Jesus Christ. Called by Christ is a 12-week in-depth study of the life of Peter. In this study you will learn of Peter's calling, follow his life as he interacts with Jesus, then observe a profoundly changed Peter as he serves and lives for God after Jesus’ return to heaven. By studying the life of Peter you will discover what it means to be a true follower of Christ. To read an excerpt of this book go to the Books page. "Who is a God like you, who pardons sin and forgives the transgression of the remnant of his inheritance? You do not stay angry forever but delights to show mercy."